We watched in horror as an Muslim Imam was ushered into the House of Representatives to pray and give a blessing. We saw our representatives bow their heads to Allah. The same week, we saw Muslims hold a service in The National Cathedral in Washington, D.C.
Be assured that these two events are not random. They are calculated by the devil himself. It’s his plan, in these last days, to convince the world that the God of Abraham, Isaac and Jacob, and Allah, are one and the same. “And God said, Let us make man in our image, after our likeness: and let them have dominion over the fish of the sea, and over the fowl of the air, and over the cattle, and over all the earth, and over every creeping thing that creepeth upon the earth.” (Genesis 1:26). God was telling us from the beginning that He is Triune! I wonder how I missed this as a Jewish child growing up in the synagogue. I wonder even more how the rabbis explain this. The moon god of Islam has nothing in common with the God of Abraham, Issac and Jacob. 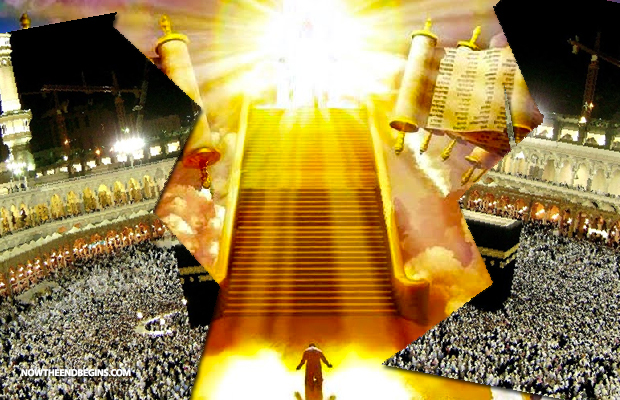 One day, Mohammed will bow down and confess that Jesus Christ is Lord, to the glory of God the Father. “Forasmuch then as we are the offspring of God, we ought not to think that the Godhead is like unto gold, or silver, or stone, graven by art and man’s device.” (Acts 17:29). “For the invisible things of him from the creation of the world are clearly seen, being understood by the things that are made, even his eternal power and Godhead; so that they are without excuse.” (Romans 1:20). “For in him dwelleth all the fulness of the Godhead bodily.” (Colossians 2:9). It is quite clear that Islam rejects the teaching of the triune God. Not only do they reject this, but they call anyone who believes it a blasphemer! Shirk: The worst sin a Muslim can commit is called Shirk. Shirk is the belief that God has a Son. It is the unforgivable sin in Islam. I find it so interesting that in Christianity, the only way to heaven is through God’s Son, Jesus Christ. We must believe that Jesus is God to be saved! In Islam, the only unforgivable sin is to believe that Jesus is God. Can you see the devil at work here? It is blatant! Pastor Rick Warren and his followers introduced Chrislam to the world. It truly amazes me that some of our so-called leaders in Christianity can have zero discernment. In an attempt to unite the world, they are turning their backs on the Bible and the essential doctrines of our faith. My husband and I used to watch Hillsong services on television. The music was amazing and so worshipful. We thought that Brian Houston, the pastor of Hillsong, was solid in his teaching. A few months ago we were horrified to see that he told his congregation that Allah and the God of the Bible were the same. Needless to say, we stopped watching and listening to him. There are MANY Baptist pastors aligning themselves with Rick Warren and Chrislam. Most keep it secret. A pastor of the FBC of Richmond, Jim Somerville, does not keep it secret. He boldly claims that our God and Allah are one and the same. He told me that Muslims simply see God through the lens of the Qur’an! The head of the Baptist Association in our area hopped on the Chrislam bandwagon over a year ago. He spends much of his time with imams and invites them to many Baptist churches. I have said it before and I’ll say it to my final breath–I believe that Allah is actually Satan. In a previous article on Replacement Theology, I named church denominations which teach this heresy. The same churches are beginning to tell their congregations that our God and Allah are the same. Catholicism has always taught this lie. I unapologetically call Catholicism a cult. The National Cathedral, where the Muslim service was held, is an Episcopal church. This is one of the churches mentioned in my previous article. They teach Replacement Theology, they ordain gays, they detest Israel, and are boycotting products made there. Obviously, they support the Palestinian cause. So, why should we be surprised that they are now worshiping Allah? When churches do not follow the Word of God, and no longer consider the Bible as the inerrant and “Holy Spirit breathed” Word of our God, they are vulnerable to becoming deluded and spiritually dead. “Now the Spirit speaketh expressly, that in the latter times some shall depart from the faith, giving heed to seducing spirits, and doctrines of devils” (1Timothy 4:1). I am SO thankful that there are Christians who still hold fast to the Word of God, no matter what they hear or read! Hallelujah!!! The Bereans received teachings enthusiastically, but still went to the Word of God to make sure that what they were taught lined up with the Word of God! Are YOU in one of these apostate churches? RUN, do not walk to the nearest exit!